Teachers! Need a fresh idea for a unit of study, reward for your students or finish the semester with a unique experience? 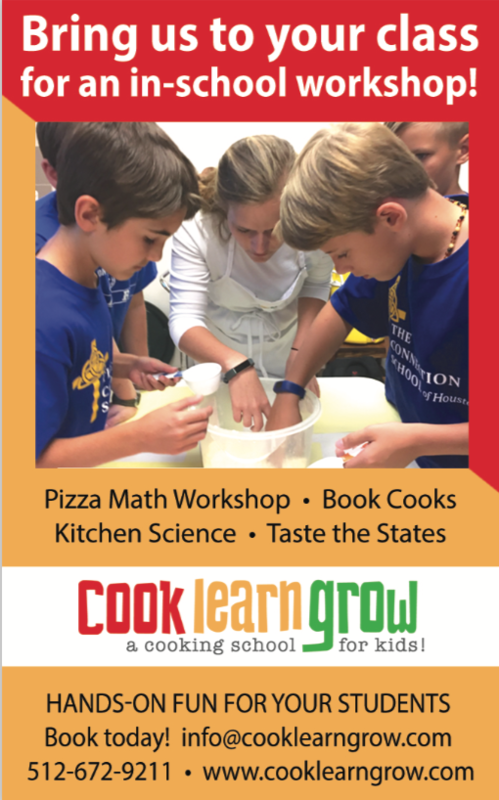 You’ll love our in-school cooking workshop for your class. Hands-on fun for your students. We bring the professional instruction and all supplies to you! Email info@cooklearngrow to book us today. One of the things we always say is kudos to the wonderful lunchroom reforms and gardening programs that are more and more available but we think one more step is needed to be fully effective…hands-on cooking! Kids need it and want it and cooking completes the cycle of healthy life skills. And it’s fun! Minimum/ maximum number of students per session is 12/16 and we can do as many sessions as you need. Standard class fee is $37 per child including all supplies, food, professional instruction and travel fees. SPECIAL DISCOUNT– $30 per child if booked by September 1 for Fall semester or January 5, for Spring semester. Title 1 campuses may have funding available for nutrition-based programs. Check with your local PTA, they may be able to help fund the workshop! Students learn age-appropriate techniques and get to enjoy the culinary creations. Class time is 1.5- 2 hours of instruction and activity. Available in Houston and Austin only.